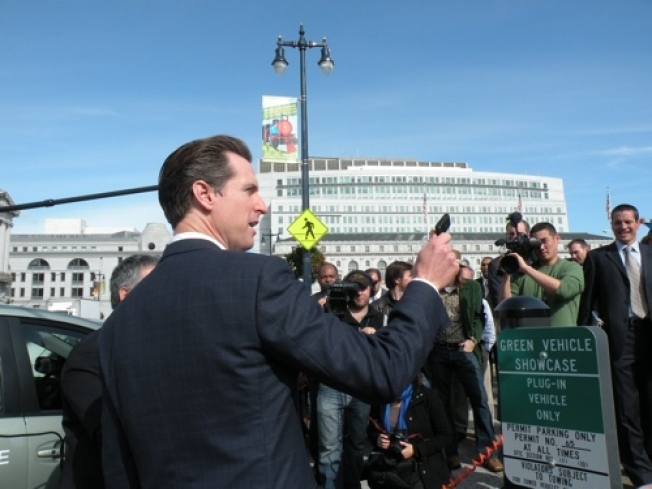 As San Francisco Mayor Gavin Newsom traipses about the state campaigning for governor, it won't be hard to spot him thanks to his choice of vehicle -- a huge, black Chevy Tahoe. Newsom is trumpeting his successes as an environmentalist, so of course it's a hybrid. Except that the electric part only increases the fuel efficiency from 17 miles per gallon to 18.7. And all the extra weight of electric motor and batteries puts the truck well over the 6,000 pound limit that would make it illegal to drive on many San Francisco streets. Or it would be illegal if it wasn't a city vehicle. So if you want to be roll in the mayor's style, you'll have to avoid certain blocks or go for the slightly more gas-guzzling version. And that's not the only law flaunting perk his honor enjoys. He can also park it wherever he wants -- even in front of cross walks and wheelchair access ramps. In fact, in the clip that got everyone talking about his intent to run for statewide office by taking a meeting with a political consultant in Malibu, the truck was parked illegally. So apparently that exemption extends all the way to the Southland! Who knew? To add insult to injury for his constituents in the city, while asking us to shop local, the vehicle was actually purchased from a Chevy dealership in Colma. It's good to be mayor. Photo by Tim Hurst. Jackson West would like to point out that real heroes like Harvey Milk took Muni.